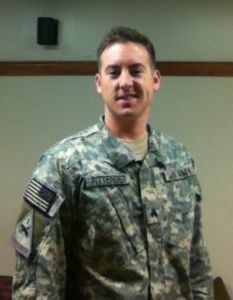 The Round Lake Area Exchange Club along with sponsor B.E.S.T are proud to announce the February Hometown Hero; U.S. Army Sergeant David Pittenger, a Round Lake Beach resident and 2004 graduate of Round Lake High School. Pittenger was registered for this honor by his mother Suzanne Bradley also from Round Lake Beach. Some of the medals and awards Sergeant Pittenger has earned are; Army Commendation medal (2), Army Achievement medal (2),Good Conduct medal (2), Iraqi Campaign medal, National Defense Service medal, Overseas Service ribbon and Terrorism Expeditionary medal. Hometown Hero Project Chair, Sherry Ridge, will be filling his Hanging with the Heroes care package with beef jerky, candy, cheese nips, ramen noodle, chap stick and a piece of home.” All “Hanging with the Heroes” care packages are delivered with a personalized “Hanging with the Heroes” t-shirt (donated by Artrageous of Hainesville), and letters from Round Lake Area School District 116 students. His mother shared, “It is really cold where he is at, they are getting the winter we did not, so chap stick is in demand.” Postage for sending the care package is covered from a donation to the Hometown Hero project made by Avon Township. The Club presented a plaque on behalf of the February Hometown Hero to his family at their meeting on February 22.